It was August 2014 and I was flying home from the Third International Marine Conservation Congress in Glasgow, Scotland, where I has just chaired a session on the impact of fake documentaries on public understanding of science. When my seatmate—a fifth-grade schoolteacher—found out that I’m a marine biologist, she decided to share this insight with me. She was referring to “Mermaids: The Body Found” and “Mermaids: The New Evidence,” a series of Animal Planet specials that aired in 2012 and 2013. “Mermaids: The New Evidence” was, at the time of airing, the most successful show in Animal Planet’s history. The conceit: that mermaids were real and that scientists from the National Oceanographic and Atmospheric Administration were actively hiding their existence from the world. A few dedicated scientists, hunted and harassed by government agents (at one point, security footage literally shows men in black removing evidence from a lab), were fighting to expose the truth. The shows were fake, though you could be forgiven if you didn’t realize that. Animal Planet, like many Discovery Communications properties, trades on its reputation for providing educational nature documentaries and lifestyle reality programs. The marketing for Mermaids leaned heavily on that reputation. Meanwhile, the disclaimer shown during the end credits flashed onscreen in tiny font for barely three seconds. Unlike works of pure fiction, the stories were framed around real events and real people and institutions. Submarine blamed a real ferry accident, in which several passengers lost their lives, on a made-up shark; the search and rescue operators who performed admirably in their response to the accident had to issue a release disavowing Discovery Communications. Actual shark scientists were looped into the Shark Week narrative, often filmed without full knowledge of the theme and purpose of the documentary. And NOAA, of course, was directly accused of hiding evidence about the existence of mermaids. NOAA was so inundated with complaints that it had to issue its own press release declaring that mermaids were not real and that there was no evidence of their existence. … Discovery provided validation for this anti-science movement and created an ecosystem ripe for exploitation by the merchants of doubt committed to undermining scientific consensus. Partially or entirely fabricated nature documentaries aren’t a new development. Documentarians have thrived off manufactured moments since the birth of the format. “Nanook of the North,” a 1922 silent film that captures the daily life of an Inuk man in the Canadian Arctic, is often considered to be the first feature-length documentary. Later interviews revealed that significant parts of the film had been staged and bore little similarity to the lives of Inuit hunters at the time. Disney’s Academy Award-winning “White Wilderness,” a 1958 feature that explored wildlife in the high Arctic, famously featured a scene of lemmings so driven with migratory frenzy that they hurled themselves off of a cliff into the freezing sea. Despite later revelations that, far from documenting natural behavior, the scene was staged and filmmakers chased the animals off a cliff, “lemmings” continues to endure as a metaphor for blindly following a crowd to self-destructive ends. Even the classic and fondly remembered nature program “Mutual of Omaha’s Wild Kingdom” has come under scrutiny for staging scenes that resulted in animal cruelty complaints. Discovery Communications hasn’t been spared these accusations, either. In a four-part investigation, Christie Wilcox, a scientist and writer, documented how “Venom Hunters,” a Discovery Channel show about amateur snake-handling, contained animal abuse, permit violations, and misrepresentation. Other shows have also been exposed over the last few years for egregious animal welfare violations. These kinds of programs muddy the waters of education-based television. In the case of documentaries like “White Wilderness,” they can actively and seemingly permanently distort our perception of the natural world or, as in “Nanook of the North,” disenfranchise modern communities by painting them as quaintly primitive. In the numerous cases of animal abuse, they cause active harm to the wildlife about which they are ostensibly attempting to educate the public. And the bold and outright fabrications of shows like “Mermaids” erodes the public’s trust in government and scientific organizations. By framing the villain in these productions as real, often nonpartisan, institutions like NOAA, they don’t just direct resources away from the agency’s actual work by forcing it to respond to a phony controversy; they lend weight to other campaigns aimed at discrediting these organizations. In the United States, the active, well-funded movement to deny the scientific consensus on global climate is adept at capitalizing on manufactured controversy. By calling into question the motives and methods of the National Oceanographic and Atmospheric Administration, an organization responsible for studying the effects of climate change on the United States’ coasts, Discovery provided validation for this anti-science movement and created an ecosystem ripe for exploitation by the merchants of doubt committed to undermining scientific consensus. Unfortunately, major cable networks have vastly greater reach than all but the biggest research institutes. This makes it incredibly difficult for scientists to mount a proportional response when their discipline, research area, or even their own lab and research, are used for fodder in these fabricated documentaries. Though media empires like Discovery Communications have a reach that far exceeds the average citizen, social media and other web-based platforms have provided a venue through which knowledgeable parties can respond to this disinformation and boost the voices of subject experts who can respond directly to false of misleading claims. Following the first airing of “Mermaids: The Body Found,” my website, Southern Fried Science, began a concerted effort to respond to that particular flavor of fake documentary. David Shiffman and I published a guide to how scientists can respond and, more importantly, prepare, in the event that they find their research misrepresented through documentary and reality programs that are fabricated, either wholly or in part. There is no easy solution, and the success of many of these shows means that the fake documentary phenomenon is here to stay. There is hope: After receiving significant criticism for its programming, Discovery’s head of programming announced in 2015 that the company would phase out these kinds of programming, at least for Shark Week. But lasting damage to the public’s trust in science has already been dealt. Primary Editor: Lisa Margonelli. Secondary Editor: Torie Bosch. 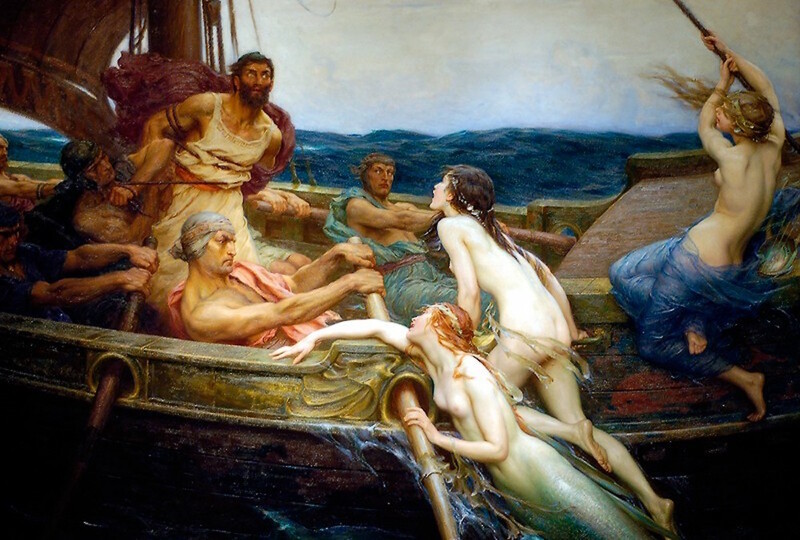 *Ulysses and the Sirens (circa 1907) by Herbert James Draper. Courtesy Wikimedia Commons.